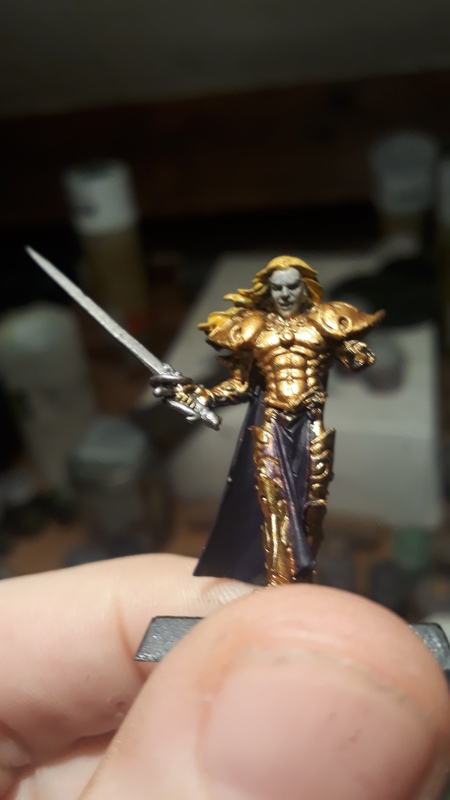 For those of you that follow me on Social Media you may have noticed I have started spending most of my time either painting or playing various forms of Warhammer. Due to the age of the game and our occasional attempts at featuring Board Games, we felt it was right to feature on our Games Revisited remit. Don’t worry for those that have no interest in Games Workshop or miniature games in general as we will keep our focus on Retro (video) Gaming, but we will start to feature more board and tabletop gaming. Warhammer Fantasy is a game that first launched in 1983 with the 1st edition. Fastforward to 2010 and the edition featured here, was released. Unfortunetly 8th Ediiton marked the end of the Warhammer Fantasy Universe as once the “End Times” expansion was introduced the story was wrapped up resulting in the World exploding. Ending the story, and the sale of Warhammer Fantasy Battles. 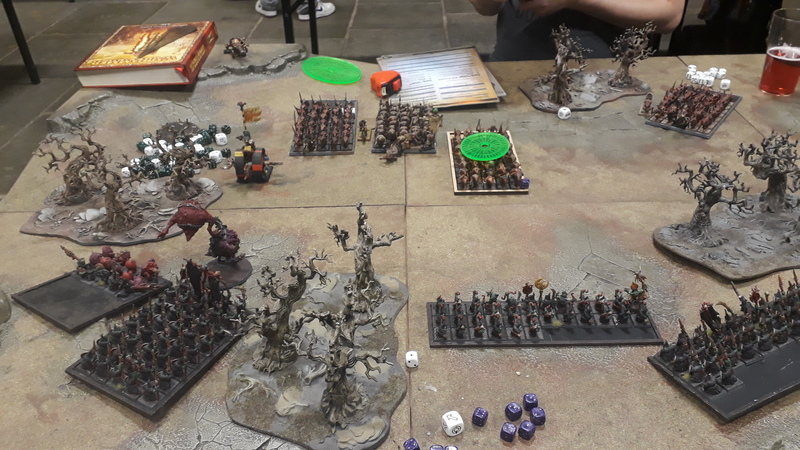 The story is carried on in Age of Sigmar, but this is a different style table top game and to many fans of the original have not moved on to it is an inferior gaming system. I will try to stay neutral on Age of Sigmar. In the 8th edition (pre-End Times), armies had to be constructed within certain parameters. You need a General, this is your leader and will offer a “Inspiring Presence” on the Battlefield, what this means is units in close proximity benefit from his Leadership which will help with panic, morale checks. These leaders are broken up into two catagories, firstly Lords. These are the leaders of a faction, they tend to be stronger, better, more magic, better weapons, better armour. Better all round. This is reflected in their points value and they are allowed to take UP TO 25% of your army. The next level is Heroes, these tend to be better than your average unit, but not as strong as a Lord. You are again allowed UP TO 25% of these in your total force. Both the hero and lord slot will include experienced fighter, or varying levels of magic users. Core as the name suggests are your core/basic troops. These will typically be your weaker units. 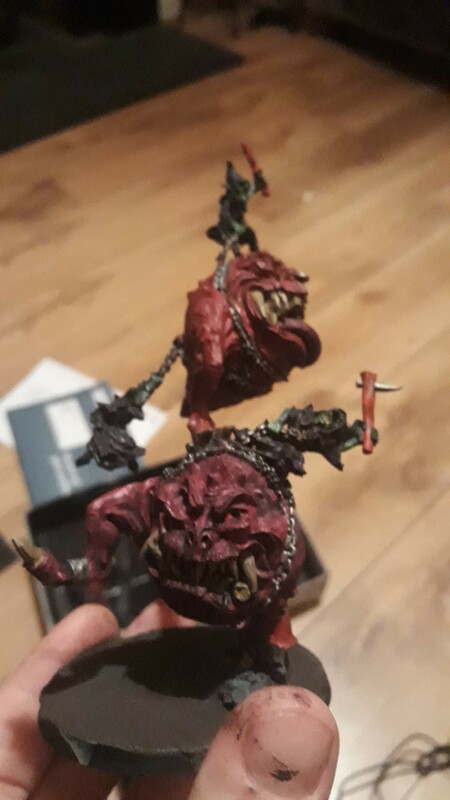 As an example, my main army is currently Goblins. My core units are Night Goblins with spears (currently about 80 of them) 40 Knight Goblins with Short Bows, as well as 16 Spider Riders. 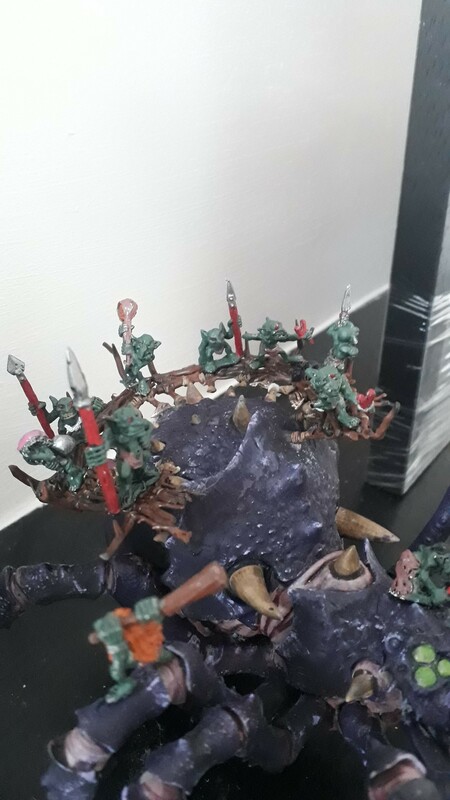 These are Forest Goblins with Spears riding on a Giant Spider. These need to take up a MINIMUM OF 25% of your army. Core troops tend to be weaker, and depending on your army will require large units. A counter to this would be Warriors of Chaos where you would get 10 Warriors and these would be the equaivelant of 40 Night Goblins. They tend to have weaker leadership but having a Lord or Hero near by (or attached to the unit) will help with Leadership. Special units are better units that tend to have more elite rules with them. This could mean special rules such as a special attack. Stronger attacks, more health, better movement. But these will take up more points. Special Units can only take UP TO 25% of your army. Rare units are your final category and will usually be made up of cooler, expensive models. This could be fancy artillery, magical monsters such as Gigantic Spiders or Dragons. These units tend to have unique rules, or are unique in that only one may be taken in your army. Rare can account for UP TO 25% of your army. Units need to form Ranks to be used, so those 80 goblins need to be placed in a row of units. 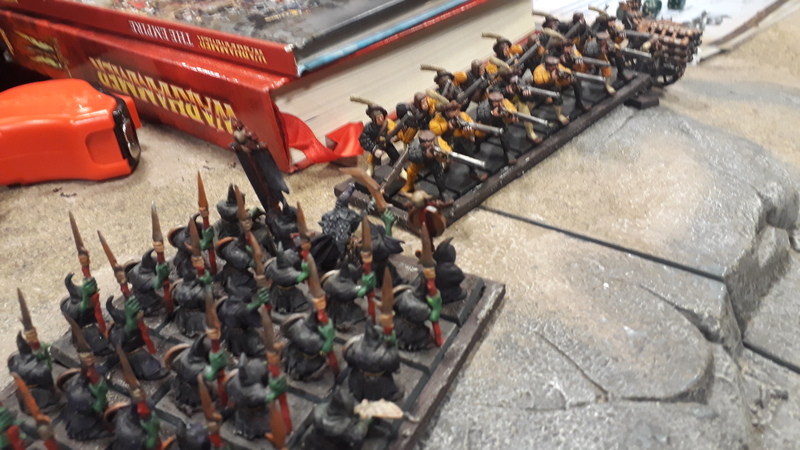 There are tactics at play here as if you are 5 units wide and 16 deep you get bonuses to winning combat meaning with a horde army like Goblins or Skaven a realistic tactic to win combat is effectively tiring out the enemy. If they only kill 10, and you kill 7 you can still win combat by virtue of having special units such as Standard Bearers and bonuses from completed ranks (caps at 3). Depending on your weapons only the from 2 or 3 rows can attack, so only maybe 10 or 15 attacks can take place (depends on the units attack ability). You use the horde rules where the front 3 rows can attack giving you a minimum of 30 attacks. This can be done by having at least 3 rows of 10. This is easily done with an army such as Skaven and Goblins, but an elite army such as Warriors of Chaos this would take up over 50% of your army in regular games. The basic order of play is each player takes a turn, and ech turn is made up of “Movement”, “Magic” “Shooting” and “Combat”. Movement is the first phase there are a number of sub-phases here. The first is Declare Charges. Do you want to try and charge an enemy? Because that is the first choice you make. Each unit has a movement range, for example 4″ they can then elect to charge by rolling 2 dice and adding those numbers to your movement. If that total is equal to or more than the distance from your enemy you will move into combat. If you fail, you have to move half this distance and make it easier for your opponent to charge you on their turn. Some units such as horses can move faster (say 10″) and can roll 3 dice and discard the lowest dice for charge distance. Next is Compulsory Movement, this is where units that HAVE TO MOVE move. Finally we have regular movement. This is where the units in your army will move their movement distance plus a potential “march” move. This means you can move double your movement but will mean you can’t shoot with bowmen or cast magic with your wizards. The Magic Phase is where you can cast magic, you roll 2 dice and the number that makes is the amount of magic “power dice” you can use to attempt to cast spells and your opponent can attempt to dispel your spell. Shooting is just that. This is where your archers and war machines make their ranged attacks. Archers can’t march and shoot, and most units unless they has a special bonus or magic item will have modifiers to their hit ability if they have made a regular move or are outside of half range of their weapons profile. Combat is the final phase. Remember those charges you made in the movement phase? Well now we resolve that (or carry on an on-going combat). Combat takes place in Initiative order so Those Lords and Heroes are most likely to go first. Some races have better initiative due to them been faster, but others have a special rule that makes them “Always Strike First“. If the fighters have equal initiative they hit at the same time. If your model hits first and you slay opponents then they are removed and cannot strike back. If you hit at the same time you can hit back before dying as you are striking at the same time. Once all of this is resolved you need to work out who has won the combat. Firstly, how many did you kill vs how many of yours were killed. Lets say I killed 3 and they killed 2. (currently winning combat by 1). Do you have a standard bearer in your unit? these add 1 to your resolution, so if you do not have one and they do. They get +1 to resolution (combat currently drawn). Do you have a Battle Standard Bearer in the unit? This is a special unit you can only have one of. Lets say you don’t have one, but the enemy does. You are now losing the combat by 1. Was the charge downhill? If so that i s+1 to combat, same for a flank charge, and +2 for a rear charge. Finally, do you have more completed ranks than the opponent. 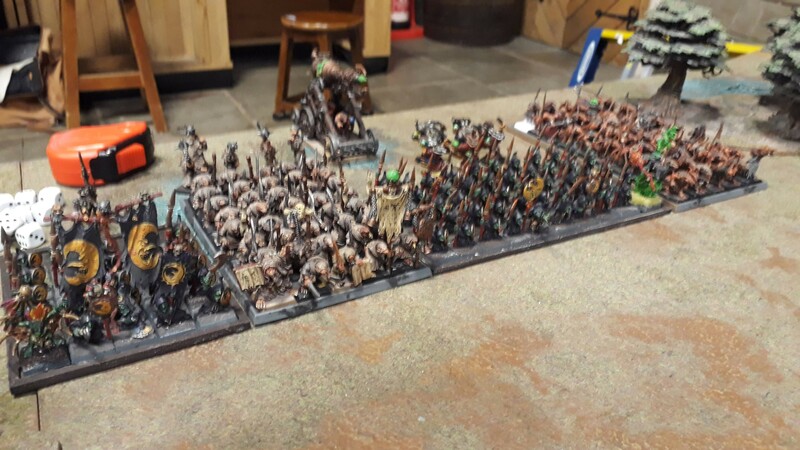 In this example I will say not, my goblins are out numbered by Skaven (rats) this is capped at 3 but a horde army can be 10-20 deep depending on how hordey they are. In this example Skaven out number me in ranks and get +3 to their combat resolution. As a result I have lost the combat by 4 points. To see if I run away or stand and fight another round I have to take a panic test against my leadership. 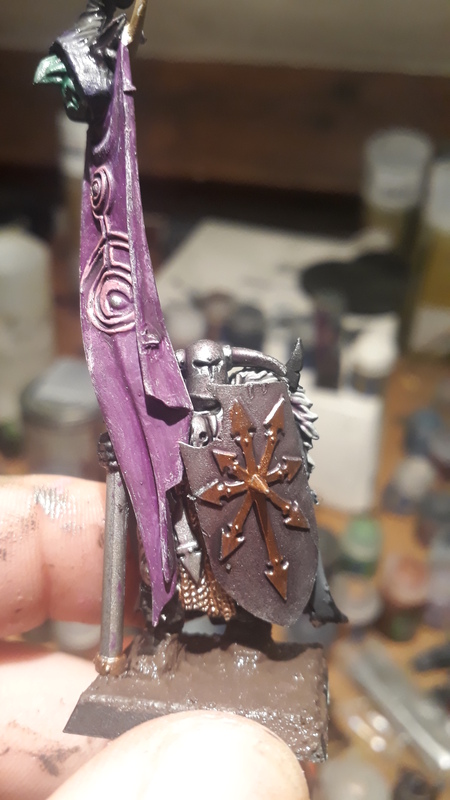 This is where a Battle Standard Bearer and a General come in useful. 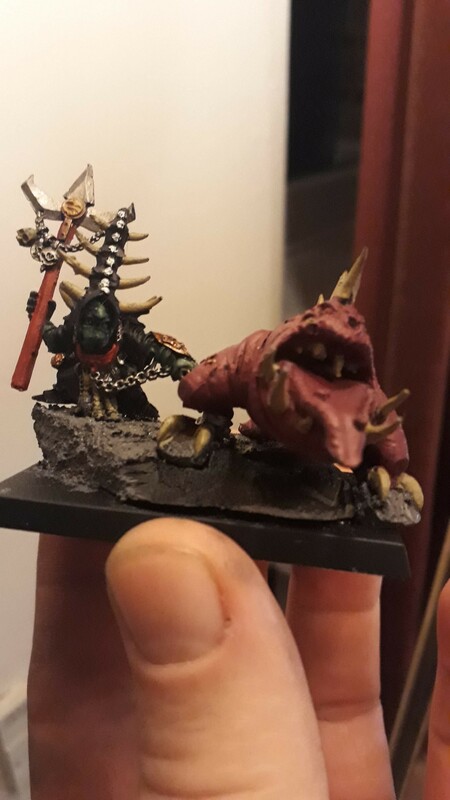 I Night Goblin has a base Leadership of 5. You minus off the 4 points you lost by and roll two dice to beat this. Obviously you can’t roll 1 or less on 2 dice, but a double 1 will always pass a leadership check. The Battle Standard Bearer if he is within 12″ will allow you to reroll your panic test. This is where your general comes in useful as they will have a better leadership. For Goblins it is still terrible (maybe 7) but for better more disciplined armies it could be as much as 10. If the general is nearby or in the unit then you get to use his leadership, which makes passing a morale check easier. In this instance you would need to score 3 or under on 2 dice. Still hard, but more possible. One other rule that would affect this is the Stubborn Rule. This means that if you have more completed ranks than your opponent you gain steadfast and you take your leadership at your base leadership without any modifiers. This is why you want to take large units if you have small weak units as you can win the combat by virtue of being numerous, or passing leadership due to overwhelming numbers. Hopefully I didn’t make any errors in the rules. I am doing this from memory mostly as a way to force myself to remember rules. But let me know if I got anything wrong. I will go into more details about Weapon Skills, Ballistic Skill and Strength/Toughness, as well as other rules in future posts. I will create them separately, but link to them all in a logical order.